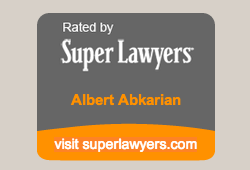 Albert Abkarian & Associates is a leading specialist law firm built and established by Trial Lawyer and Esquire, Albert Abkarian. We serve the greater California area, specifically Los Angeles, Burbank, Glendale and Pasadena. Our field of expertise are in the areas of business law, real estate law, personal injury (car and motorcycle accidents, wrongful death, worker's compensation accidents), as well as international law (contract formation and ICC arbitration). We provide you the individual attention you need for the success of your case. We pride ourselves on giving personalized service, maintaining one-on-one attention to all our cases and clients. Here, you get the high quality service and resources of a large firm while taking advantage of the cost-effectiveness of a small firm. With our focused attention on our practice areas, namely, International Law, Business Law, Real Estate Transactions, Personal Injury and Worker's Compensation, and Arbitrator Mediator Discovery Referee, you can rest assured that your cases are handled by highly-skilled lawyers with years of experience.